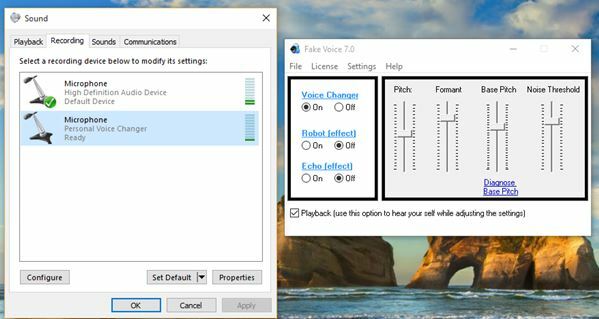 Here’s a list of 5 voice changer software for Windows 10, which you can use to change your voice and apply various effects. One of the main reasons why someone would need voice changing application is to prank friends, family, and coworkers. That’s the reason why I decided to set out on a search for voice changing software on Windows 10. Applications from the list down below either apply voice changing effect to existing recordings, perform live processing (for use in chat), or create fresh recordings. Let’s have a look at what exactly it is that’s available. 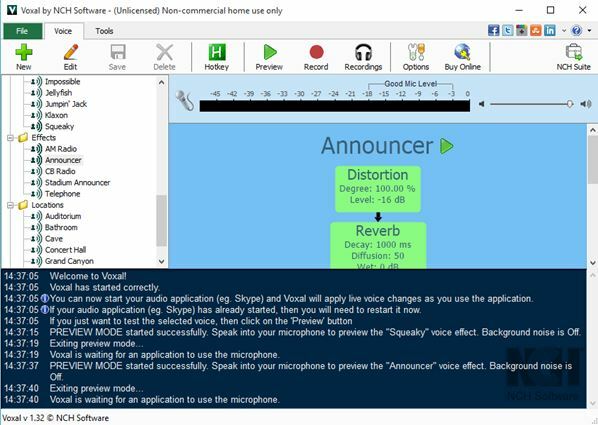 Free Voice Changer is a voice changer software for Windows 10 which will take existing audio recordings and apply various effects to them. It supports WAV, MP3s and WMA audio tracks as input/output. In the top file select section, click on “Browse”, to load up the file. Next in step 2, use the pitch shift and speed change to do the actual voice changing. In the 3rd step you’ll get a chance to preview the effect that you’ve setup by tweaking the pitch and speed of the recording. Last step is to initiate the actual export of the finished product. Now I had some problems with test files. Application seems to be a bit picky about what kind of codecs and audio settings (no 48000khz audio support) will work. Keep that in mind if you decide to go with Free Voice Changer. Free Voice Changer by Kate makes things a bit more interesting when talking about voice changer software for Windows 10. I’m referring to the fact that you can use it for real time audio processing so that you can use the changed voice in audio chat sessions on Skype, for example. Notice on the image above I have 2 microphones in the systems settings that I have open. Normally there’s just 1 microphone. Free Voice Changer by Kate will add its own virtual microphone device that you can select in applications that use a microphone (like Skype). Your voice is going to be detected by the hardware microphone and then fed into the virtual one. Virtual microphone then distorts the voice based on the settings you tweak in the application. There are presets for robot voice and voice echo. You can further change the voice by tweaking pitch, formant, base pitch and noise threshold. Important thing for Skype or any application, like sound recording software, is to change the input microphone to the virtual one for everything to work properly. Get Free Voice Changer by Kate. Also have a look at Free Android App To Change Voice: Ultra Voice Changer. Skype Voice Changer is a voice changer software for Windows 10 aimed directly at Skype. It is a Live voice changer, so you can participate in a voice chat with a changed voice. Great thing about Skype Voice Changer is that it’s optimized for Skype, so if you have Skype installed, it will automatically tweak everything so that it works with Skype. Drawback is that it only works with Skype. To tweak the application, and the desired effects, open it up and head over to the “Effects” tab. Use the plus icon in the toolbar up top to add effects. Available effects include tremolo, delay, super pitch, chorus, and EventHorizon peak eating limiter. Each effect is further customizable using the sliders to the right. 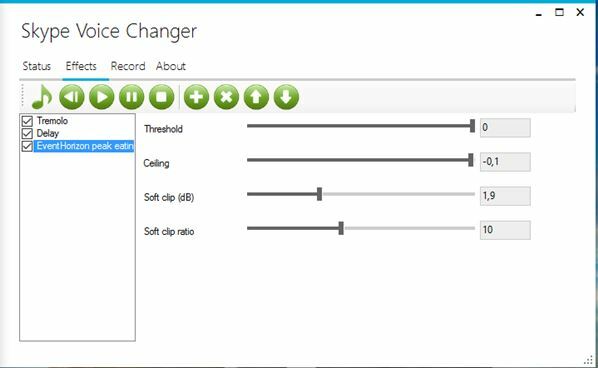 Pro version of Skype Voice Changer also allows you to record Skype calls. Voxal Voice Changer is one of the most advanced, if not the most advanced, voice changer software for Windows 10 that I tested. You can see that from the screenshot above. Interface is riddled with options. The most important would be the list of voice effects from the sidebar on the left. Voxal Voice Changer supports both live processing (so it can be used in Skype and other applications) and it can also record your changed voice with it’s built-in sound recorder. To apply a certain effect from the left sidebar just left click on it. Double click will open up settings where you can additionally tweak each effect. The list of effects is quite extensive. There’s child, female, demon, Darth Vader, robot, radio announcer and about a dozen other effects. Each effect can be previewed before use by clicking on the “Preview” button from toolbar up top. To use Voxal Voice Changer in third party apps (like Skype) just run them after running Voxal. It will automatically detect them and set its own virtual microphone as the input device. Also have a look at Voice Changer App for Android To Change Voice, Add Effects to Voice. Voice Changer by Viscom is a bit of a step back from the more advanced voice changer software for Windows 10, like Voxal, that I covered up until this point. 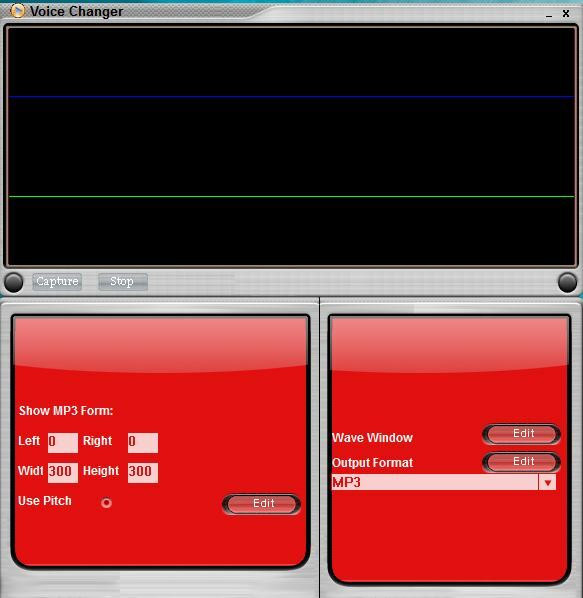 With Voice Changer by Viscom you can only make a recording with the changed voice. It is only a sound recorder. There are also no presets or anything like that. Just a slider that lets you change the voice pitch to sound either very squeaky (child) or very low (adult man). Use the settings down below to tweak the voice effect and the output format. Supported output formats include MP3, WAVE and WMA. Get Voice Changer by Viscom. Voxal Voice Changer is the most interesting voice changer software for Windows 10. I also liked the Free Voice Changer by Kate. Each application has its advantages. 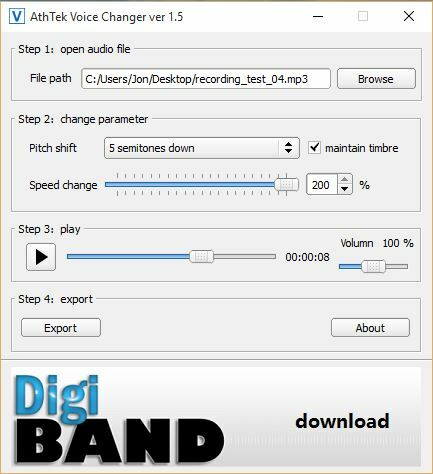 Free Voice Changer by Digi Band for example is great for changing voice in existing audio tracks. Let me know what you think by dropping a comment down below.